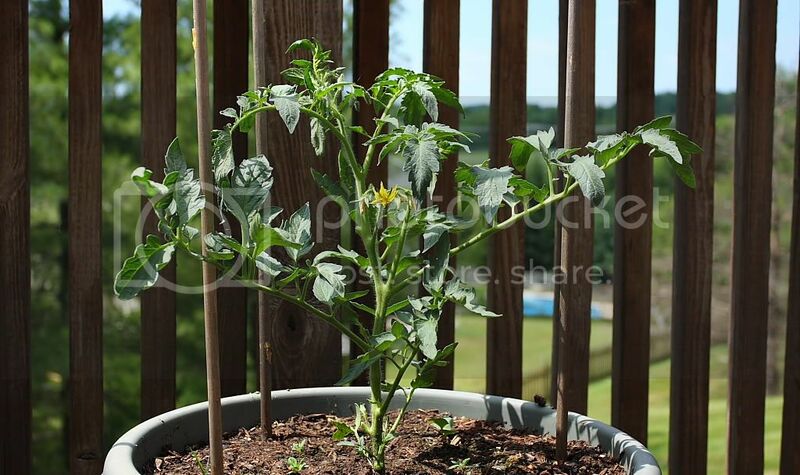 Last year Beth took a stab at growing odd vegetables in pots on our deck, so we could make less nickle and dime grocery store trips for things like peppers and tomatoes. She started pretty late in the season last year so in September we ended up with a bell pepper the size of a big toe and maybe two regular sized tomatoes that only grew to the size of a Cadbury Egg. The saving grace was our two cherry tomato plants that grew quickly but due to the number of plants only yielded a handful of 'berries' a week. This year we're trying again, starting earlier (last month) and adding some additional herbs to the mix. 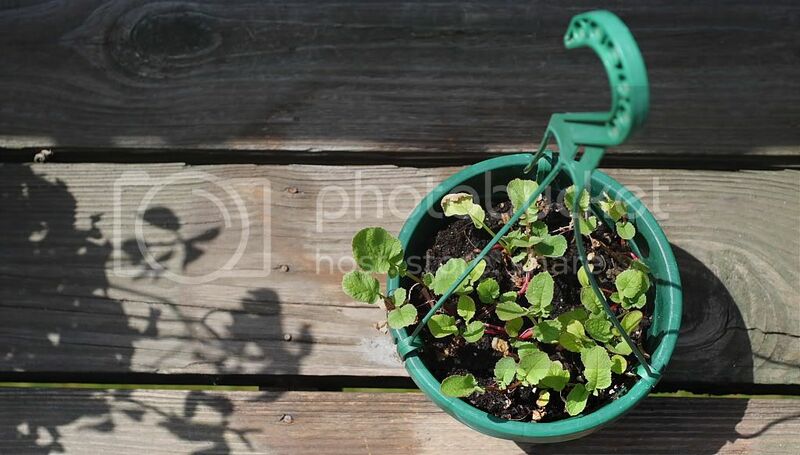 Rosemary plants are pretty robust and did well in the pot last year, so we're going at it again using a plant from my parents collection (which will come up again in later episode), including some radish plants they donated as well. Unfortunately half of the small plants from this years effort struggled with the transition to the new plant pots and soil. A failed experience with a Topsy Turvey (as seen on TV) put into the mix and she was batting 400. 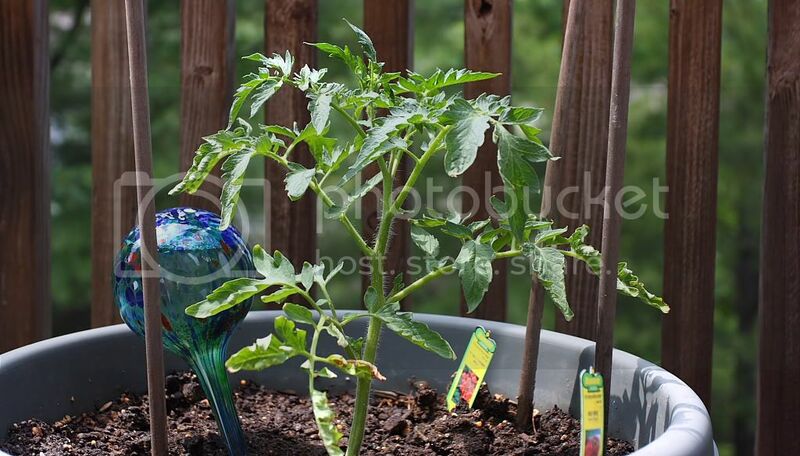 One of the tomato plants that never faltered is growing well and should be showing small fruit a couple of weeks or so. It appeared we had the same droopy branch & root rot problem with a hearty tomato plant that she got from my parents to replace one of the failed originals, as it was watered sufficiently but wilted in the sun. Recalling some old info my mom told me long ago I think I figured out the problem though; not enough oxygen getting to the roots. I added some holes to the potting soil with the sticks we use for vine guides and monitored the moisture levels with a watering globe...even did the soil aeration for the plants that were doing well. Now, after a week or so of the new setup, all of our plants are on the rise at a very noticeable rate. 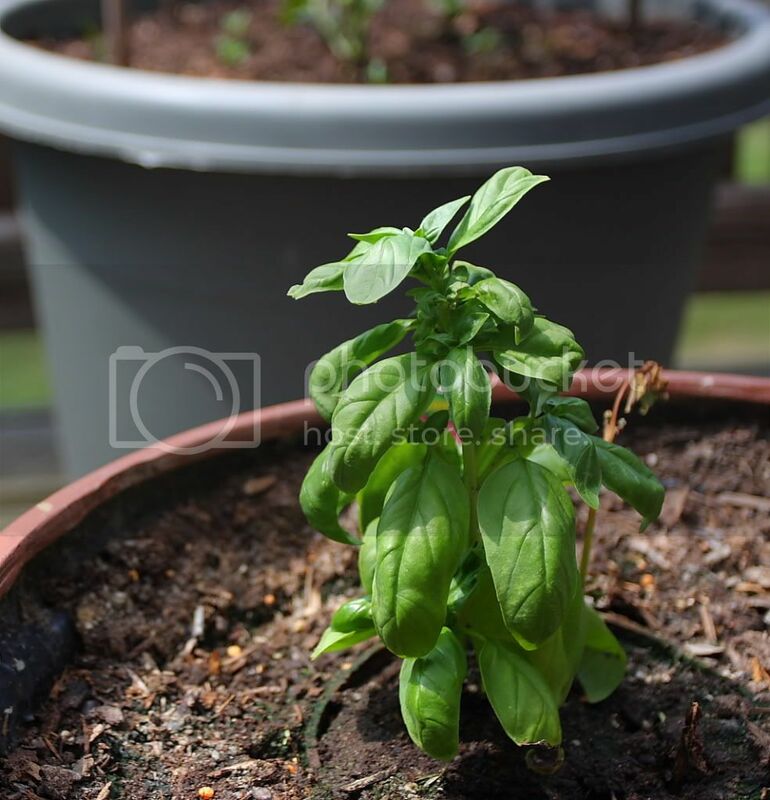 Adding another small vegetable or two to the basil pot may be down the line, but getting what's currently growing a little further along is the current job.